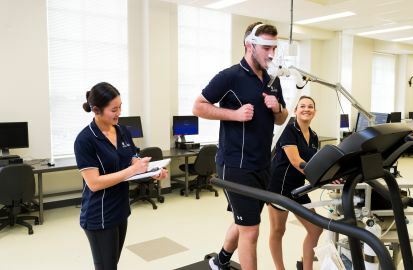 Study Bachelor of Exercise and Sport Science at the University of South Australia (UniSA). Information for International students. Complete placements across a range of industry settings, including schools and sporting clubs, and benefit from elite sporting partnerships. Learn in state-of-the-art on-campus facilities designed for exercise testing and performance analysis, such as our High Performance Sport Centre, Exercise Physiology Clinic, Environmental Chamber and a Health and Fitness Centre. Choose to study a double degree and combine your interests with Nutrition and Food Sciences, or Psychological Science (Counselling and Interpersonal Skills). Follow on from this degree with postgraduate study in areas such as physiotherapy or occupational therapy. Develop an understanding of the impact that exercise and physical activity has on the biological, psychological and social parameters of human life when you study this industry-focused specialisation in exercise and sport science. You will learn how to design and deliver exercise programs to improve clients’ health and wellbeing, and undertake client screening, conduct laboratory and field testing, and appraise and interpret scientific research. You will also learn from world-class industry experts, in a state-of-the-art environment that provides opportunities for practical learning. This industry-focused degree will develop your ability to design and deliver exercise programs to improve clients’ health and wellbeing. In your final year of study you will focus on professional studies and the application of exercise science. In addition, you will learn practical skills and effective communication skills, how to conduct laboratory and field testing, design and implement exercise and training programs, and interpret scientific research. Practical experience is a key focus and you will be able to directly apply this learning through industry placements and engagement. 4. Students must complete at least three level 3 electives. 2. Students can select a secondary Study Stream by selecting at least four electives from a particular elective group. However, students may select electives from a variety of elective groups. 3. It is recommended that students select 5 courses from Advanced Exercise and Sports Science, Rehabilitation Sciences, Nutrition and Dietetics or Sports Coaching, but may also undertake courses from Health and Physical Education and Outdoor Education study streams. 4. One elective may be chosen from outside the Division of Health Sciences. Course pre-requisites must be satisfied. Other electives can only be taken outside the Elective Groups listed with the Program Director's permission. 5. All electives may not be available each year but will be offered according to student demand. World-class teaching staff and state-of-the-art learning facilities mean this degree is a great choice for students interested in the science behind exercise and sport. In the first year you will complete a placement, meaning you will be exposed to industry from the very beginning. You will also benefit from our on-campus facilities, which are extensive and are a great way to develop practical skills and explore and experience the hands-on nature of this growing industry. We have teamed up with a number of elite and local sporting organisations, including the Port Adelaide Football Club, Adelaide United and Basketball SA, providing you with excellent networking opportunities. You will also complete various placements, including one at a kindergym, as well as 140 hours of exercise delivery and prescription placement across a variety of settings, further enhancing industry networks and relationships. In addition, we also host regular University-wide employee master classes and employment expos, and alumni events in Australia and overseas. As the No.1 University in South Australia for graduate employment in Health1, you will be well placed to pursue a career in this field. With the health, wellbeing and nutrition industries continuing to grow, employment prospects for graduates of this degree are promising. You may also find yourself working in other industries where high levels of education, leadership, communication and organisation are valued. Become even more employable by combining your Exercise and Sport Science degree with another degree. With just one year of extra study you can graduate with a double degree. Your options include Nutrition and Food Sciences or Psychological Science (Counselling and Interpersonal Skills). If you finish your degree with a credit or higher grade point average (GPA) you could also be eligible to proceed to postgraduate study in areas such as occupational therapy or physiotherapy.